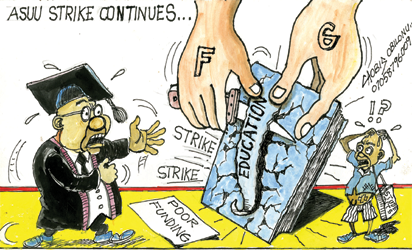 on and will be released to ASUU when the process is completed,” he said. He reiterated government’s resolve to grant permanent licence to ASUU to operate the National University Pension Fund Administrator Company (NUPENCO) that will manage the contributory pension of public universities. To this end, the Minister explained that Federal Ministry of Education has been directed to liaise with National Pension Commission for the release of the permanent licence. Ngige also assured on the resolve of the Buhari administration to offer undisclosed amount from the N220 billion annual revitalisation fund for universities which was agreed during President Goodluck Jonathan’s administration but was reneged on. He said government was going to look for funds and that a token which he did not disclose has been offered to the union to demonstrate governmentas good faith. According to him, ASUU is expected to return back to Government between Wednesday, 9th or Thursday, 10th January, 2019 to sign relevant agreements reached by the parties. While speaking Prof. Biodun Ogunyemi, ASUU President who confirmed the agreement however noted that some of the proposals from government requires further consultation with ASUU members. “We have had an extensive session looking at all issues. There are issues that require further consultation at the level of our union before we can take a stand,” he said.